[ACT](VC) Limit Break 4 (This ability is active if you have four or more damage):[Counter Blast (3) & Choose three cards from your hand, and discard them] Retire all rear-guards in each fighter's front row, and this unit gets [Power]+10000/[Critical]+2 until end of turn. ...Armor Break Dragon is a very interesting card as it's one of the few cards in the game that can get to Triple Critical by itself, which basically says that if it hits you at that damage, then more than likely, you're probably going to lose. However, with the extra Criticals and Power comes a huge sacrifice, and for Armor Break Dragon, it's the cost of 3 Counterblasts and discarding 3 cards in your hand. Also, you might want to watch your field as you do this effect also seeing how it destroys all players' frontline rear-guards. For most people, the cost and consequences really outweigh the benefits that he gives. 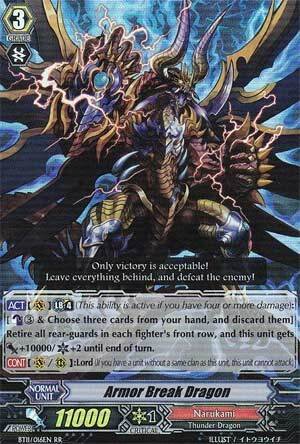 Armor Break Dragon isn't essentially a bad card, but definitely a risktaker's avatar seeing how it'll probably be your final turn if you use his Limit Break. Next Time: No turkey, but it's still a bird nonetheless.